After flash VIVO Y55s dead, After flashing Vivo Y55s with QFIL (Qualcomm Flash Image Loader) the handset goes dead, means after flash success the phone do not switch on and when connect the to Computer it shows only QDLoader Qualcomm Flashing Port. 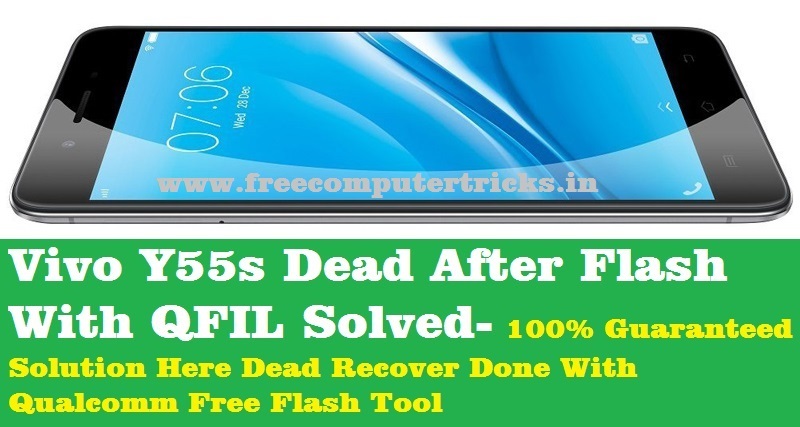 Here I will give 100% working solution to recover the dead Vivo phone using free flash tool, no need to use any flashing box and this tool is working fine without box or hardware. To recover or unbrick Vivo Y55s you need to follow the complete process or tutorial given in this article, first need to download Vivo Y55s working and tested firmware (Link given below), you can direct download the firmware no need to wait on any other pages such as showing skip button, so download Vivo firmware direct and high speed link for the model Vivo Y55s and this firmware includes QDLoader .mbn file and content .xml file with patch.xml file. To flash the phone you need to install Download Qualcomm HS-USB QDLoader 9008 USB Driver (Link given below) and QFIL flash tool download link also given below and Miracle Box latest version working without box can be download here. Vivo Y55s dead recover done using Miracle box, when I flash the Y55s phone using QFIL Tool, gets some flashing error message and after that the phone do not switch on, and again try to flash with other firmware version using the QFIL flash tool but not success, it shows Sahara Fail QFIL error, then finally I flash the phone using Miracle Box free tool and successfully recover the dead phone, to know how to recover Vivo Y55s dead phone after flash, please go through the complete tutorial here, every process is very important and requested to read the topic carefully and then apply it to recover the dead Android smartphone. Before we going to flash the phone and download firmware, let's know the technical specification of Vivo Y55s, which helps you to know the chipset details and other technical details such as Storage, RAM, Android version etc. The phone is released on 2017 February and available in Indian market, the dual SIM smartphone has Android 6.0 Marshmallow Operating System with Funtouch OS 3.0. Qualcomm MSM8917 Snapdragon 425 is the chipset used in this phone, which helps to know the correct Loader .mbn file with need to select while flashing the phone. The phone comes with 16 GB internal storage (External storage can expandable up to 256 GB using microSD card) with 2 or 3 GB RAM, if you see the camera feature of this phone, then the phone also has 13 Mega Pixel main camera with 5 MP secondary or front camera, you can get the full phone specification on the official Vivo smartphone website. First download Vivo Y55s firmware, flash tool and EDL Mode USB driver (Link given above), then follow the below process to unbrick the phone and know the complete process how to flash Vivo Y55s Android smartphone, using free Vivo flash tool. This solution is also very helpful, if you are facing flashing errors while flash the Vivo Y55s using QFIL Qualcomm flash tool. Choose Write Flash and Untick Auto File Hose (FileHose). Select Flashing method EDL Mode and click on start button. Wait until the flashing complete then manually switch on the phone. So in this way you can flash Vivo Y55s with Miracle box and also recover the dead Vivo Qualcomm phone. Please follow the tutorial carefully, then flash the phone, this is tested and working for us and sharing here to help others, if you need you can try this at your own risk.